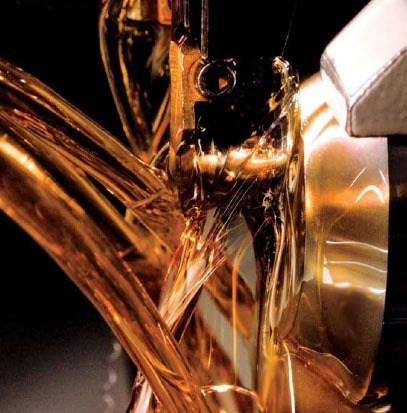 Cutting fluids contribute 3 ways to our machining processes. Critical to our shops for three reasons. 1) They provide lubrication. Lubrication reduces friction. Reduced friction means less heat. Less heat means better dimensional capability and faster cycle times are possible. 2) They help remove heat. Even though they provide lubrication, some frictional heat is produced. So the ability to capture, and remove heat is an important property of metalworking fluids. 3) They prevent the welding of workpiece material onto the tool.Pressure of the workpiece against the tool and the heat and temperatures involved contribute to the buildup of workpiece material on the tool. Cutting fluids provide an antiweld film to discourage this. For a thorough tutorial on the subject of cutting fluids, check out Barbara Donohue’s article on this subject in Today’s Machining World click this link. This entry was posted on Thursday, July 1st, 2010 at 4:00 am and is filed under Engineering, Shop Floor. You can follow any responses to this entry through the RSS 2.0 feed. You can leave a response, or trackback from your own site.